When I was working on transforming our master bedroom, I wanted to do something unique for the bed/headboard. 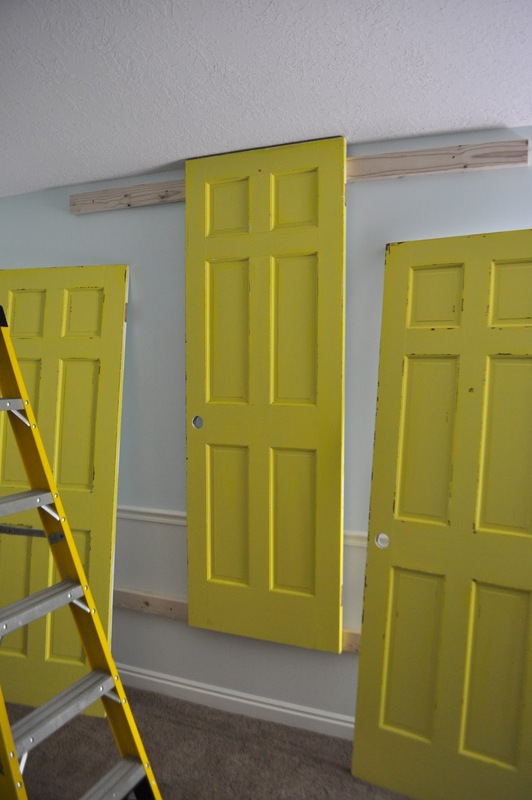 I've seen a lot of headboards that are repurposed doors, but usually they add molding and disguise the fact that it's a door. I like the idea of blatantly showing that it was made from doors. I was lucky because my sister gave me a few from her home when they updated the doors there. They had been painted white, but the paint was peeling. They were perfect for the project I had in mind. She had two different sized doors, so we did a little math and figured out that 3 of the smaller ones would be a few inches wider than our bed. Perfect. I started by giving all the doors two coats of paint. 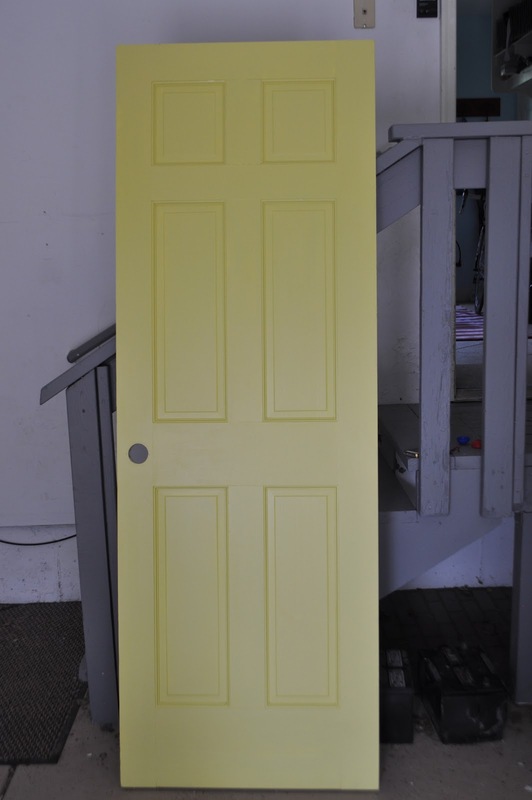 They are Funky Yellow (by Sherwin Williams), which has a tinge of lime to it. I used any metal device I could find in the garage to rough up the doors a little and give them the aged look. I didn't poly over them because they aren't going to get a lot of wear and tear - and even if they did I wanted them too look old anyhow. I wanted the doors to go all the way to the ceiling. To attach them, my dad screwed two 2x4s to the wall, directly into the studs. 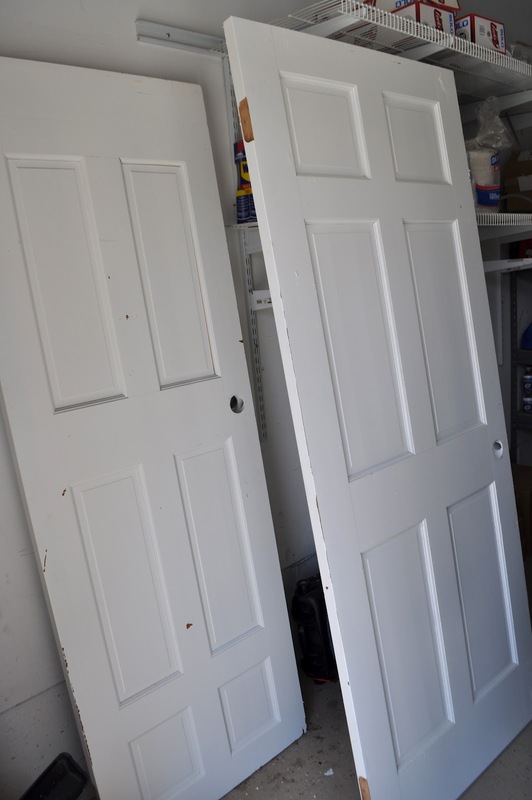 Then the doors were screwed right to the 2x4s. The 2x4 was not only helpful to support the doors, but it also made it so that the chair rail didn't need to be removed behind the doors. After mounting the doors we needed to add the hardware - knobs and then numbers. The knobs were mis-matched and purchased at Hobby Lobby. And there you have it - a vibrant, fun headboard for almost free. The simple, white quilt is from Target. I love it because it's thin and it fits in my washing machine. And if you didn't catch the whole reveal, you can see the whole room HERE. - So while we were watching our awesome garbageman today, he commented on my haircut and told me he liked it. He said he noticed it last week, but didn't get to say anything. Yes. We have the world's kindest garbageman ever. - I switched out the blog header today and I'm updating somethings. If you're in a reader you might want to click over to the blog. It's a pretty funny picture. I LOVE your new blog header - awesome pic!!!! We are getting a new bed next week and I REALLY want to have doors like you - it looks so great! Thanks for showing us how you did it! Love the blog header-and the "at the watercooler" section! I love your new header! Adorable! LOVE your hair too. Love the header! Too cute! You look great! Love the head board...... the numbers are super cute! I love your master bedroom redo, it's inspired one here at my house. Also, I think you look like Snow White in your new header picture. So cute! Love the header picture! Your headboard is so cute. I've been looking for some inspiration for sprucing up the bedroom. Noticed the header immediately, I LOVE IT!! Baden is the world's cutest viking! Love the new header ~ too cute!!! Cute pic! Also, love the anniversary numbers...can't wait to have a house to steal this idea for! LOVE, love, love your new headboard!!! so creative and love your blog too...it's a daily read!! What a cute new header, and of course headboard :). You are great, Cheri.